Luo Zhijun, the former Party Secretary of China’s coastal province of Jiangsu, is the latest member connected to ex-Chinese Communist Party leader Jiang Zemin’s political network to be suddenly moved from a top office recently. State mouthpiece Xinhua reported on June 30 that Luo was being replaced by Jiangsu governor Li Qiang due to age reasons. Two days later, Luo was sworn in as vice chairman of environmental and resources protection committee in the regime’s rubber stamp legislature in an official ceremony. Although Luo will hit the official retirement age of 65 this November, it is irregular for provincial level Party cadres to be suddenly moved out of a post with executive power to a figurehead role—in this case the deputy director of Environmental Protection and National Resources Committee in the National People’s Congress—in the final leg of their career. Luo’s transfer is, however, in line with a recent trend of high-ranking officials from Jiangsu Province getting ousted. Ji Jianye, former mayor of Nanjing in Jiangsu, Zhao Shaolin, former provincial standing committee member and secretary general, and Yang Weize, former Party Secretary of Nanjing, were purged in 2015. 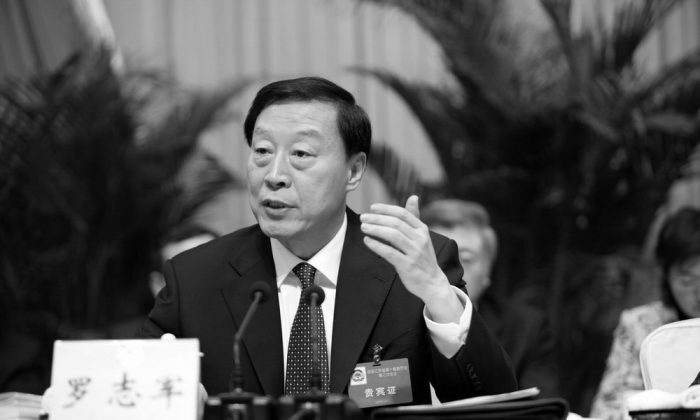 This May, former Jiangsu deputy provincial governor Li Yunfeng was investigated for “severely violating Party discipline”—a catch-all phrase for malfeasance or political rivalry. Party leader Xi Jinping’s purge of Jiangsu appears to be aimed at diminishing the influence of former Party leader Jiang Zemin. China’s eastern central province of Jiangsu is both Jiang’s birthplace and one of his power bases. Xi has been steadily uprooting Jiang’s political network since taking office in 2013. Luo seems to be aware of this context, given his remarks following his demotion. But three years ago at a book launch ceremony for Jiang Zemin’s book in his hometown of Yangzhou, Luo had instead offered the following praise for Jiang: “Comrade Jiang Zemin was supported and beloved by the Party, the military, and people from all ethnic backgrounds,” Luo said, and added that Jiang’s new book would “urge all cadres and masses in the province to continue to struggle,” reported Xinhua. Luo had a good reason to be supportive of Jiang. According to overseas Chinese news publication Bowen Press, former General Office head Ling Jihua had promised Luo the position of Ministry of Public Security chief if a coup against Xi—that Ling was planning with the disgraced former Politburo member Bo Xilai and former security czar Zhou Yongkang—was successful. Ling, Bo, and Zhou are firm allies of Jiang Zemin. Of a piece with his factional affiliation, Luo Zhijun is also involved in the brutal persecution campaign against the traditional Chinese spiritual discipline Falun Gong that Jiang Zemin ordered in July 1999. The World Organization to Investigate the Persecution of Falun Gong (WOIPFG), a nonprofit research organization based in the United States, has confirmed at least 13 deaths during Luo’s tenure as mayor and Party Secretary of Nanjing, and at least 48 deaths during his time in Jiangsu. WOIPFG holds Luo accountable for the death of Wu Di, a former employee of the Suining County Farming Machinery Factory in Jiangsu. For refusing to renounce Falun Gong and give up the practice, Wu was fired from her job, forced to divorce her husband, and injected with nerve-damaging drugs while she was incarcerated at a psychiatric ward in Xuzhou, Jiangsu Province in 2001, according to an account on Minghui.org, a clearinghouse of information about the persecution. Wu Di was arrested again in 2002 and imprisoned until 2007. On Nov. 10, 2008, Wu suddenly went missing following months of repeated harassment by local security officials, and was later found to have drowned in river in Jiangsu’s Suining County.